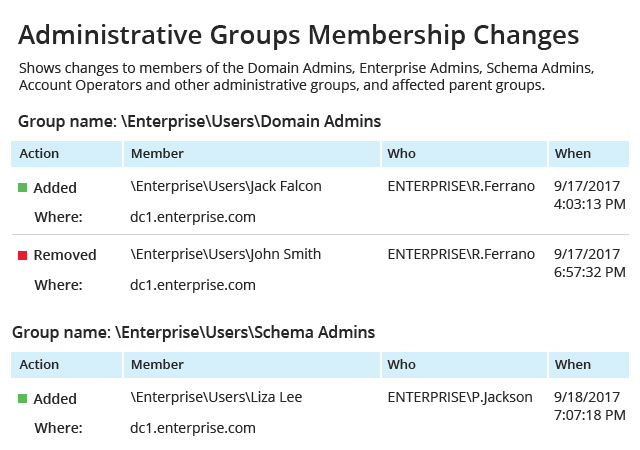 With native Active Directory reporting and auditing tools, it’s not easy to get detailed information about who made what change and where. 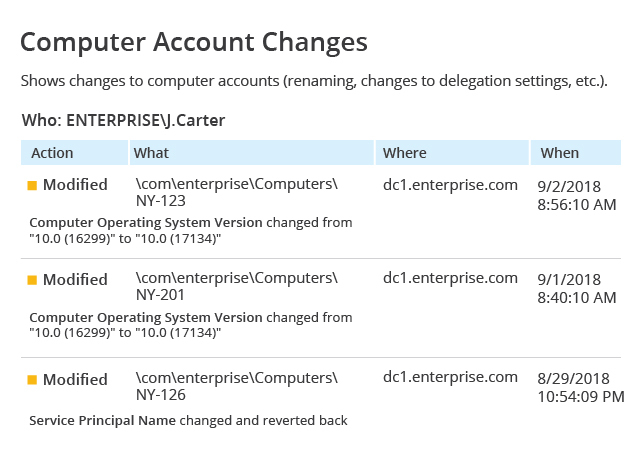 Netwrix Auditor includes a set of prebuilt reports on critical changes — including changes to password policies, software settings, domain controllers, organizational units, AD users and computers — so you can detect and revert unwanted modifications before they result in security breaches or downtime in your IT infrastructure. 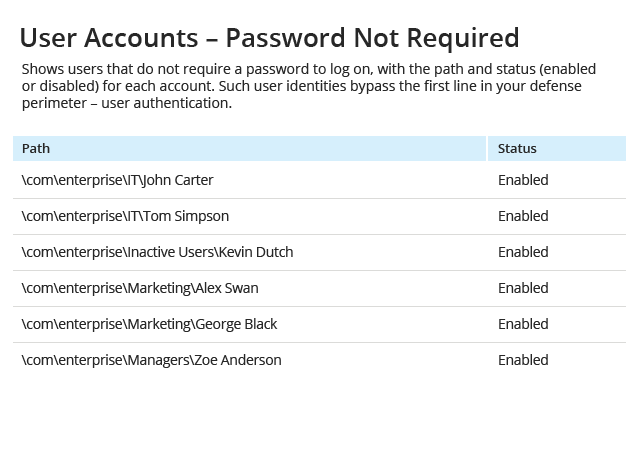 If you don’t audit user logons, sooner or later you’ll miss unauthorized attempts to log into your domain. 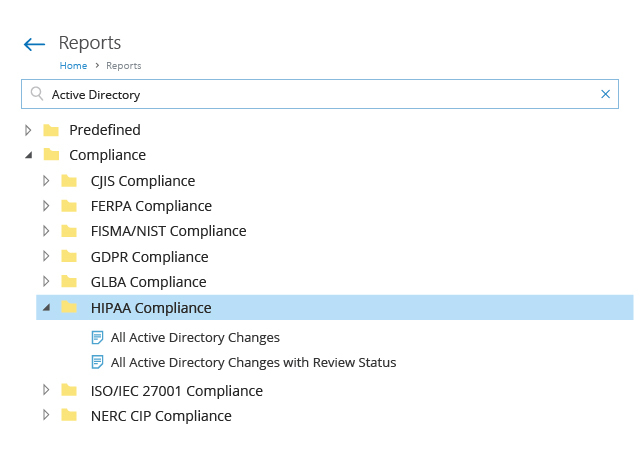 With the Active Directory reports in Netwrix Auditor, you can enable continuous auditing and reporting on every logon attempt, including whether it failed or was successful. 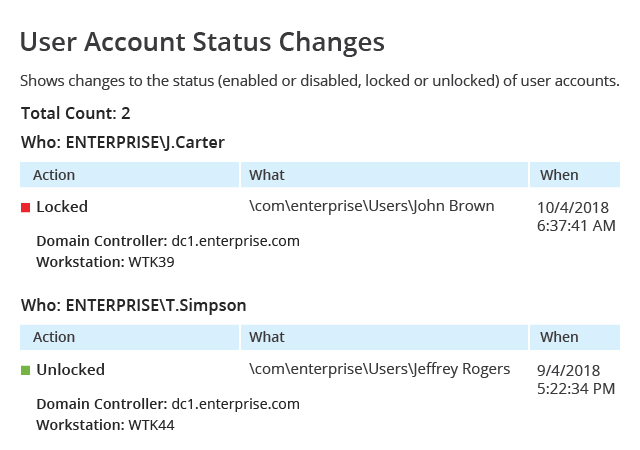 This will help you validate your access controls and detect even subtle intrusion attempts that don’t cause account lockouts. 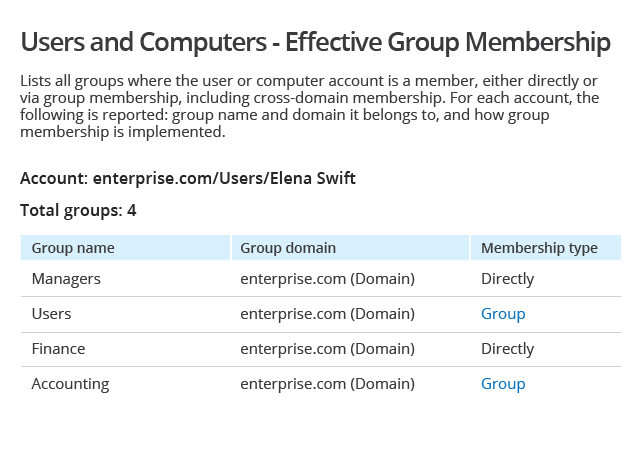 To make sure that group membership, effective permissions, account policies and other critical controls are in line with a known good baseline, you need a powerful Active Directory reporting tool. 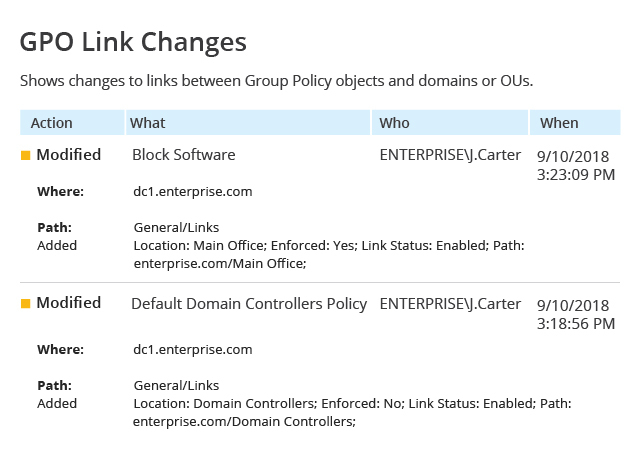 Netwrix Auditor helps you compare the current state of your Active Directory and its objects, including OUs, DCs, and Group Policy objects and their settings, so you can mitigate cyber risks and enforce good IT hygiene. Without a bird’s eye view, it’s hard to spot configuration issues in your environment. 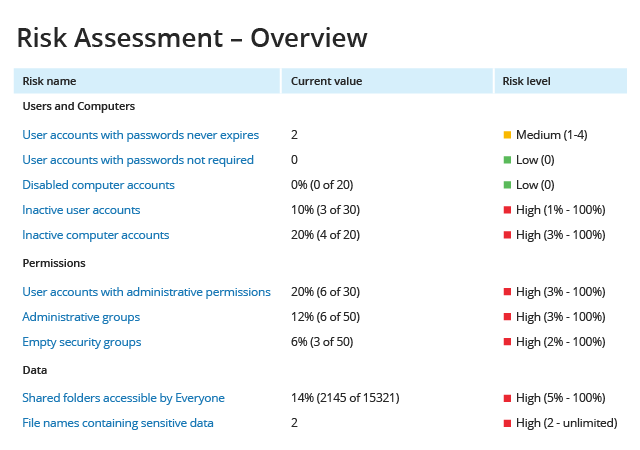 The Risk Assessment dashboard points out the most critical misconfigurations — like Active Directory users with no password required, inactive user and computer accounts, empty security groups, and intricate nested group structures — so you can remediate these weak spots before attackers try to exploit them. AD reports are useful for regular review, but you also need alerts to catch security events as they happen. 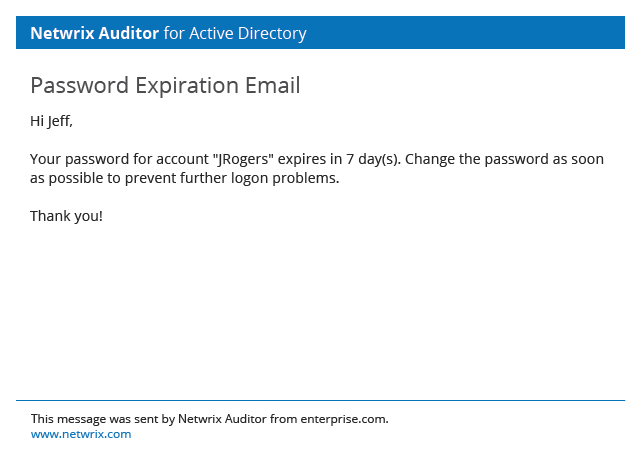 Netwrix Auditor provides ready-to-use alerts and makes it easy to create custom ones so you can promptly respond to critical AD changes, multiple failed logons and other threats that put the security of your organization at risk. Many reporting tools can alert you when a single event occurred or a specific threshold has been exceeded — but some threats are more sophisticated than that. 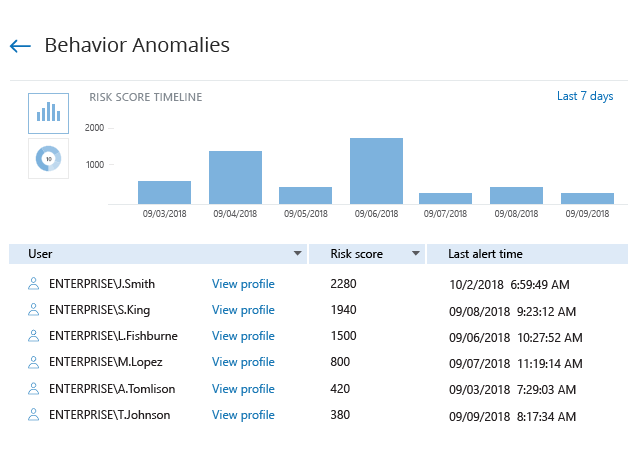 To spot those threats, Netwrix Auditor provides a single view of all anomalous activity alerts triggered by an individual across all audited systems, along with the cumulative risk score, so you can make sure that no malicious insider slips under your radar. 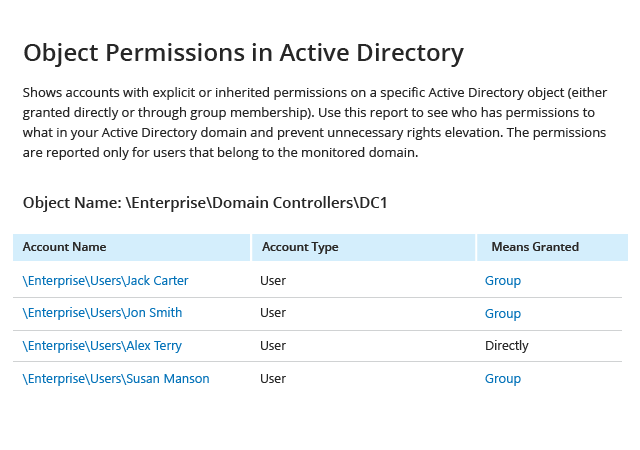 To protect your environment, it’s crucial to know about every unusual event that took place in your Active Directory. Netwrix Auditor’s reports on user behavior and blind spot analysis enable you to quickly identify subtle indicators of threats and investigate what’s happening before serious damage is caused. 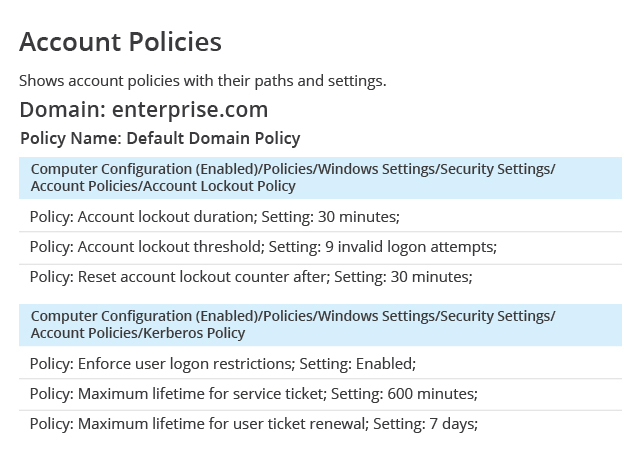 For example, you can see when someone is active outside business hours or tries to log in a domain from several endpoints at the same time. When a security incident happens, you can’t afford to waste time digging through native logs or reports to get a specific piece of information. 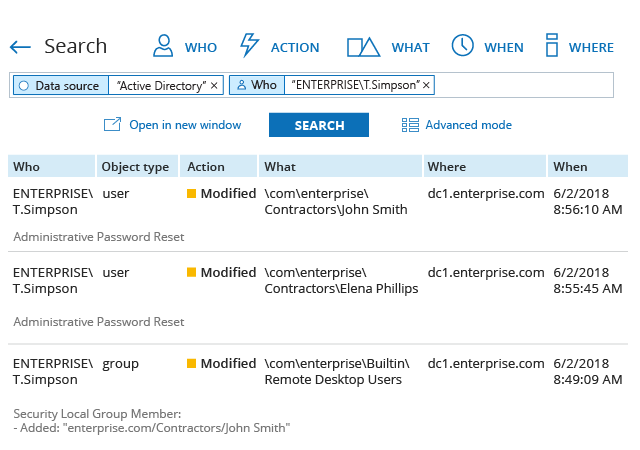 Interactive Search enables you to find what you need in a few clicks, whether you need to quickly investigate what a rogue admin has been up to or track down who made unwarranted GPO changes. You can export your findings to a PDF or CSV file, use the subscription option to have the information from your search query delivered to you on schedule, or set up an alert to be notified about similar incidents in the future. To spot unusual surges in user activity, you need a single-pane-of-glass view of changes. 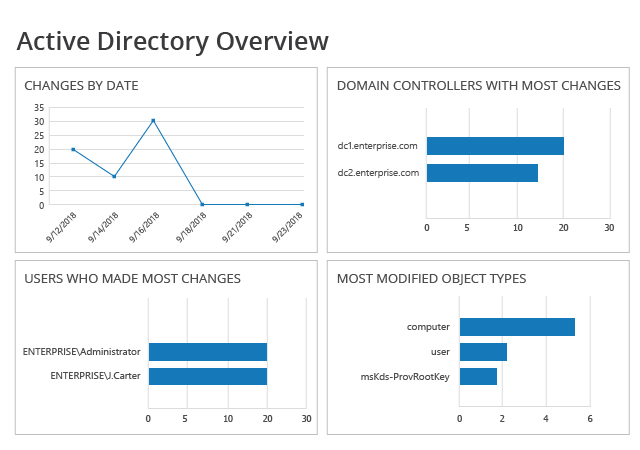 Netwrix Auditor’s overview dashboard makes it easy to identify the users who have made the most changes, the domain controllers that are most frequently changed, the object types that are most modified, and spikes in changes by date. Not every reporting tool can help you with compliance audit preparation. Netwrix Auditor enables you to pass compliance audits faster and with less effort by providing out-of-the-box compliance reports tailored to PCI DSS, HIPAA, GDPR, SOX, GLBA, FISMA/NIST and other common regulatory standards. 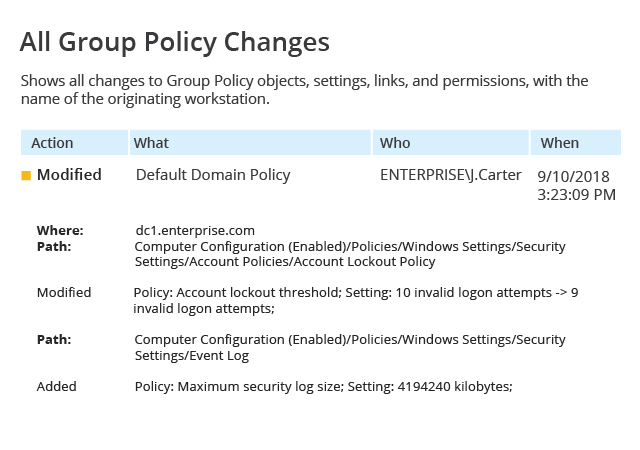 When an unwanted change occurs, it’s not simple to recover Active Directory objects and attributes with native tools. 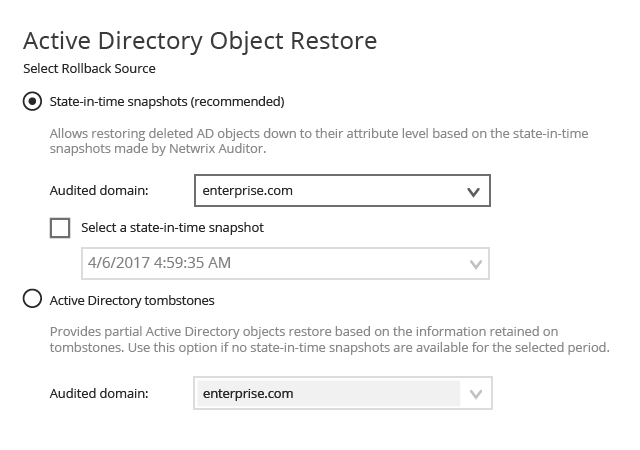 With Netwrix Auditor, you can revert incorrect changes to a previous state without any downtime or having to restore from a backup. To help you handle the most time-consuming management tasks faster, Netwrix Auditor for Active Directory has a number of integrated tools. 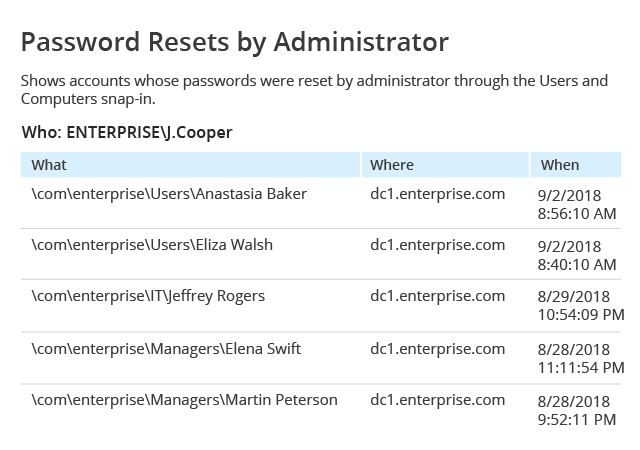 For instance, you can track down stale user accounts and automatically remind users to change their passwords before they expire and users get locked out. Unlike many other Active Directory reporting tools, Netwrix Auditor can be integrated with any commercial or custom application. This enables you to expand visibility into other systems and have your entire audit trail available from a single place. Free, ready-to-use add-ons are available for many common applications, including SIEM solutions and ServiceNow ITSM. If handled manually, routine tasks like dealing with AD user account lockouts and creating helpdesk tickets can eat up a lot of time. 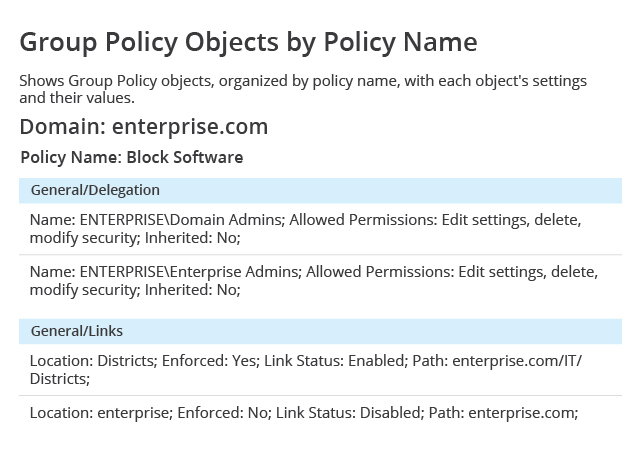 With Netwrix Auditor, you can automatically handle tasks like these by embedding scripts in alerts, which ensures a prompt response and lets you stay focused on more important tasks. Native Active Directory tools don’t provide an easy way to compress and retain historic audit data. Netwrix Auditor can store your audit trail in a two-tiered (file-based + SQL database), cost-effective storage for more than 10 years, and enables you to easily access the archived data for historic reviews and inquiries. It’s important to keep the AD reporting and auditing process secure. You can make sure that only authorized members of your IT administration and business teams can view AD reports and configure auditing in Netwrix Auditor by granularly assigning the appropriate access rights to everyone who needs them. 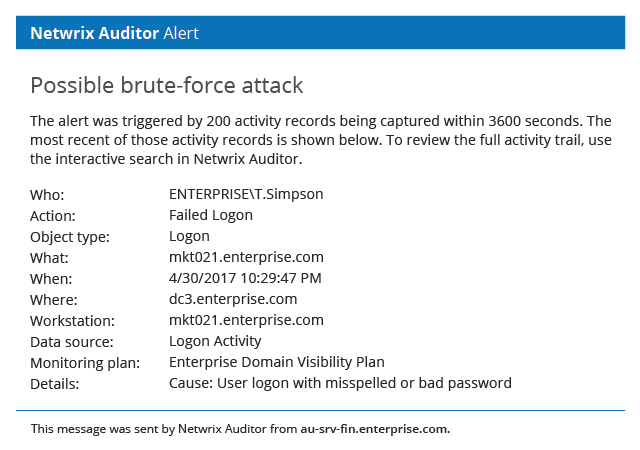 Learn how Netwrix Auditor for Active Directory can help you detect data insider threats, pass compliance audits with less effort and increase the productivity of your IT team. 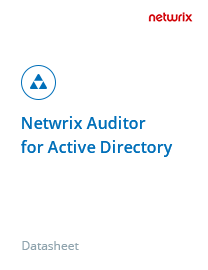 Get a convenient list of features of Netwrix Auditor for Active Directory in a fill-in-the-blank format that facilitates comparing it with other vendors’ products.